This 3 on 3 game is more like a 6 on 6. To set up place each net just inside the blue line. Divide the players into groups of three. Three players from each team will start out in the middle, they can go anywhere int he neutral zone, blue line to blue line. Three more players are stationed along the blue line. The players along the blue line have to stay within several feet of the blue line. On the whistle, one puck is played into the middle. Players play three on three but they can use their "bumpers" on the blue line for added support. The bumpers can pass the puck to the players in the middle or to other bumpers. 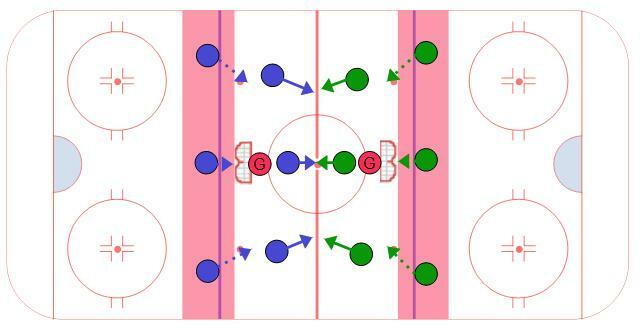 Although it is a small area to play 3 on 3, players can use the bumpersto spread the play out and try to get open in front of the net. It is also a challenge for the team without the puck to cover the front of the net.